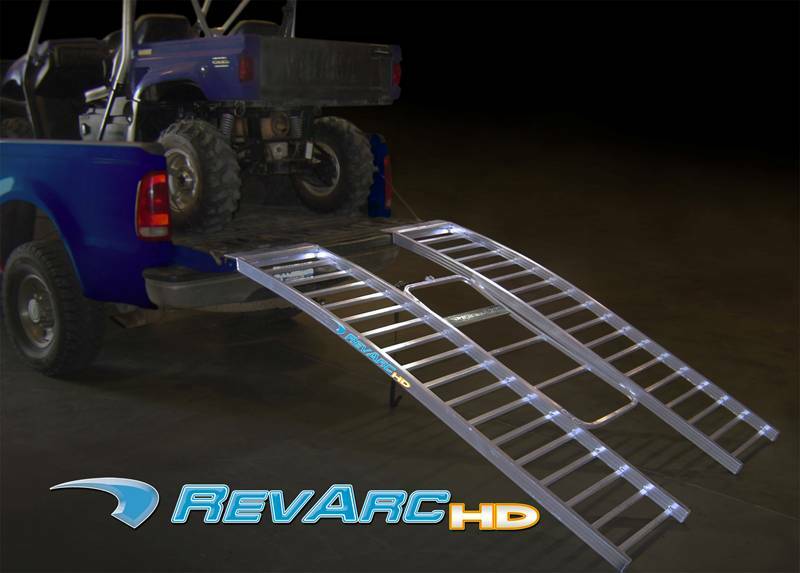 The latest edition to the RevArc line of ramps is the new RevArc HD (Heavy Duty) designed to load large Side by Sides into a truck or trailer. With a 2100 lb capacity, 64” wide, and 90” long, this ramp can work with Yamaha Rhinos, Polaris Rangers, John Deere Gators, and Argos. Consumers benefit with a safer load angle compared to a conventional ramp due to the longer length feature, plus the advanced arched design offers a superior smooth transition from bed to ground. At 48 lbs, the lightweight design can easily be positioned and handled by anyone, and it slips under an UTV for easy storage. RevArc HD is an innovative hybrid ramp. It features the performance of an arched ramp with the stability and safety of a tri-fold ramp. Because it is simple to use, consumers rarely have to second guess whether the ramp is lined up with the UTV. Just position the ramp, lock the single strap, and load with confidence. Ramp twisting, sliding, or slipping is greatly reduced with a RevArc HD. Many companies talk about safety, but Bosski actually did something about it with RevArc ramps. Finally, Bosski gives UTV owners extra piece of mind with a Limited Lifetime Warranty. Should the ramp ever malfunction from defects in workmanship or materials, Bosski will repair or replace it. The RevArc HD retails for $299.